This Tibbit is capable of generating up to 1.5A of 5V power from the external input in the 8-60V range. 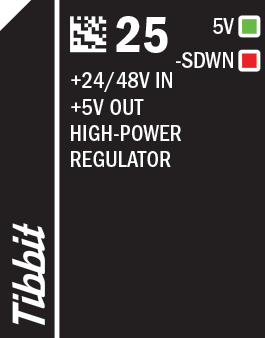 Although this Tibbit is primarily intended for 24V and 48V applications, it is equally suited for 12V systems (albeit the current it is capable of providing with 12V input is lower). Multiple power supply Tibbits can be used to increase available current or for power redundancy. The module has a dedicated shutdown (-SDWN) line. Pull the line LOW to disable this Tibbit. Combine this Tibbit with #18 (it has a power jack and two terminal blocks), #20 (nine terminal blocks), or #21 (four terminal blocks). There is one green and one red LED. The green LED is connected to the +5V output and lights up when the voltage is present on this line. 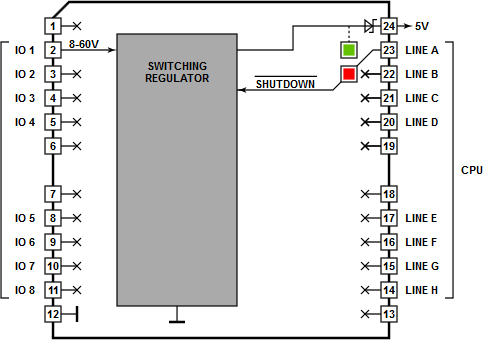 Red LED is connected to the -SHUTDOWN line and lights up when the line is LOW (i.e. when the power supply is in shutdown).